Helsinglight is a creative haven in Hälsingland Sweden. We offer workshops in SFX makeup, silicon mask making and special effects. We also offer alternative art exhibitions, concerts and events. Helsinglight is a creative haven and artistic destination in Vattlång, Hälsingland, mid north of Sweden. It is a creative nest for SFX makeup & mask workshops, as well as a place where alternative art exhibitions, music nights, festivals and various alternative events etc will be organised. We're located in the beautiful countryside and we think of it as a creative haven and an inspirational retreat, away from all the buzz and stress one can experience in the big cities. We believe the countryside is a great place for artistic adventures and experiences. A place where your creativity will fully boost and where you will find yourself in a process of reconnecting with yourself, with the seasons, the nature, the people and the world around you. The inspiration found in nature and the quality of time spent together with like-minded people during workshops, events or other activities cannot be underestimated. One must also be more creative with coming up with things to do when you live or spend time out in the countryside. There are not coffee shops, cinemas, pubs, clubs, theatres etc around every corner. If you live in the countryside you rely more on creative or outdoor-oriented activities for entertainments, such as painting, photographing, walks, horseback riding, skiing, swimming etc. Helsinglight! The "castle" of our dreams! 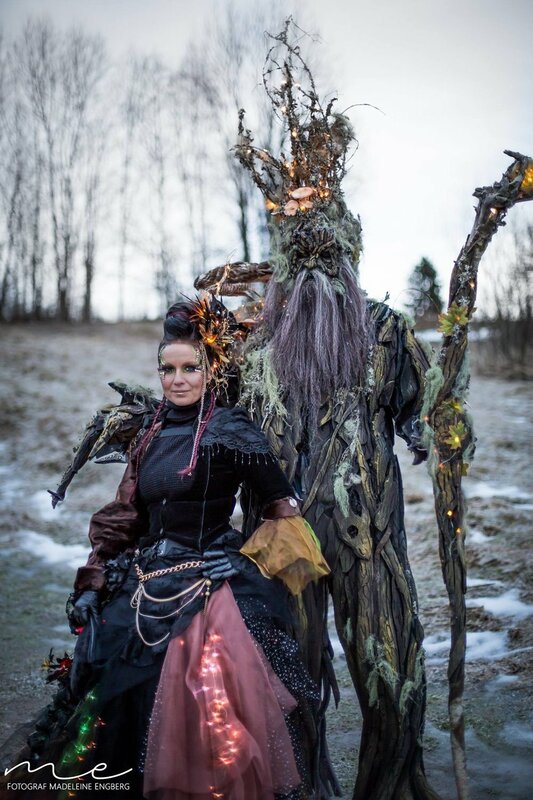 SFX Makeup Artist Petra Shara Stoor with the Ent character she created for the winter festival Midvinterglöd 2016. When you visit Helsinglight you're invited to be part of something special. Helsinglight is located in a beautiful big brick house built in 1920 and this building used to be a school from 1920-1965. When the school shut down Nordanstig municipality bought the house and rented it out until the artist Gunnar Greiber bought it and lived there for 20 years. Gunnar Greiber had his art studio and organised art exhibitions in the house. After Gunnar Greibers death creative concept artists Petra Shara Stoor and Fredrik Fernlund got the opportunity to buy the house, a place where they saw the future for Helsinglight! Helsinglight is currently being renovated and Petra and Fredrik mostly describes their vision for the renovation and visual concept of Helsinglight to be a mix of Narnia, Harry Potter, Pans Labyrinth and Hälsingland (Sweden). Bit by bit Petra and Fredrik are getting closer to their dream of opening the doors to Helsinglight SFX Makeup Academy, Art Gallery and Events. The aim and plan is to launch open the art gallery of Helsingligth and SFX-workshop areas in spring/summer 2018! We will showcase unique, alternative art in our art gallery as well as invite you to various music events and concerts with an intimate, alternative touch to them. We are hoping to launch open our art gallery and music venue in spring 2018! We organise alternative, subcultural events and experiences. All from smaller intimate concerts and art performances to bigger artistic festivals and events.